West Ham United's Mexican striker Javier Hernandez celebrates after scoring. WATFORD have scored five times in a Premier League game for the first time, belting Cardiff City 5-1, and Fulham has lost 3-1 at West Ham United to edge closer to the drop. Spanish attacker Gerard Deulofeu became the first Hornets player to score a hat-trick in the EPL era, before captain Troy Deeney chimed in with two goals of his own. They came either side of Sol Bamba's 82nd-minute consolation strike for the hosts. Javi Gracia's side went ahead in the 18th minute after a mistake from Cardiff defender Bruno Manga allowed Deulofeu to score, but Watford ran away with the game after the break. Deulofeu made it 2-0 with a clinical finish after a swift break in the 61st minute, and the former Barcelona and Everton winger completed his hat-trick after more poor defending from Neil Warnock's side. Deulofeu then turned creator, teeing up Deeney for a simple tap-in as Watford romped to a four-goal advantage. Cardiff pulled a goal back through defender Bamba but Watford added further punishment with Deeney's second in stoppage time. Watford has moved up to seventh while Cardiff remain 17th - one place and one point above the drop zone. Fulham fell deeper into relegation trouble with their loss to the Hammers at London Stadium. Claudio Ranieri's 19th-placed side made the ideal start when they grabbed the lead in the third minute. Former Liverpool forward Ryan Babel was on target from close range after he had earlier missed a golden chance. 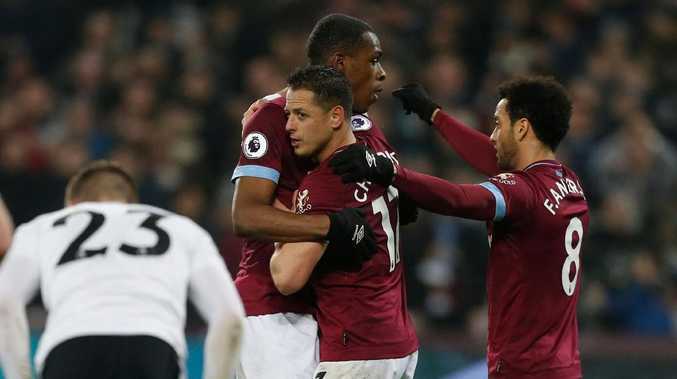 There was controversy about West Ham's equaliser - Mexican striker Javier Hernandez stooped to head in from close range but replays suggested the ball went in off his arm. Issa Diop's first Premier League goal, with a header five minutes before the break, put West Ham in charge and they were well on top after the break. Marko Arnautovic and Manuel Lanzini made their returns for the Hammers as substitutes. But it was not until stoppage time that the Hammers made sure of the win as Michail Antonio powerfully headed home a cross from Arnautovic.